It all started in 2005 with Laura Losada, a Yelm resident who had a vision of a local store with organic, natural and local ingredients. Others believed in her vision and soon, according to volunteer Robyn Hawk, “A very small handful of people somehow got another small handful of people to get a fair amount of money so that they could start this co-op.” Everyone involved volunteered hundreds of hours, raising money, learning about the ins and outs of running a co-op and applying for grants. In addition, several members of the leadership team at the Olympia Co-op contributed guidance and expertise for nearly a year. The store opened its doors in April, 2007 in a small commercial building in Yelm’s Frontier Village, where anyone attempting to navigate an aisle would literally rub elbows with someone coming the opposite direction. “It was important to open a storefront in order to begin building a history and reputation within this community,” says Rintz. Originally, the co-op was a member-owned corporation. In 2012, the board of directors asked the membership to vote on becoming a non-profit community service organization with a focus on education and food. The idea was a hit; 96% of the members who voted favored the new vision. However, there were still more challenges for the store. 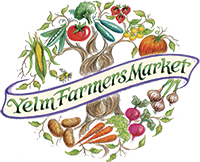 After 4 1/2 years as a non-profit under the Yelm Cooperative umbrella, the IRS made a determination that Yelm Food Co-op was in fact a for-profit company and would have to be separated from Yelm Cooperative\Yelm Farmers’ Market operating as non-profit. This was an unexpected upset for all. Yelm Cooperative, the parent company decided to change their name to Bounty For Families and along with the Yelm Farmers’ Market as their subsidiary and go their “non-profit” way. On January 1, 2017, Yelm Food Cooperative went back to its original equity based company status. The original equity members who had paid equity up until 2012, before the company went non-profit, were re-established as equity members and we began accepting equity memberships again. We continue to operate as an organic and natural food market offering our customers and members the best quality we can.